The Philadelphia Bar Association celebrates Law Week 2018 from April 30 – May 4 with an array of free community service events coordinated by the Association’s Young Lawyers Division (YLD) and presented by volunteer lawyers. 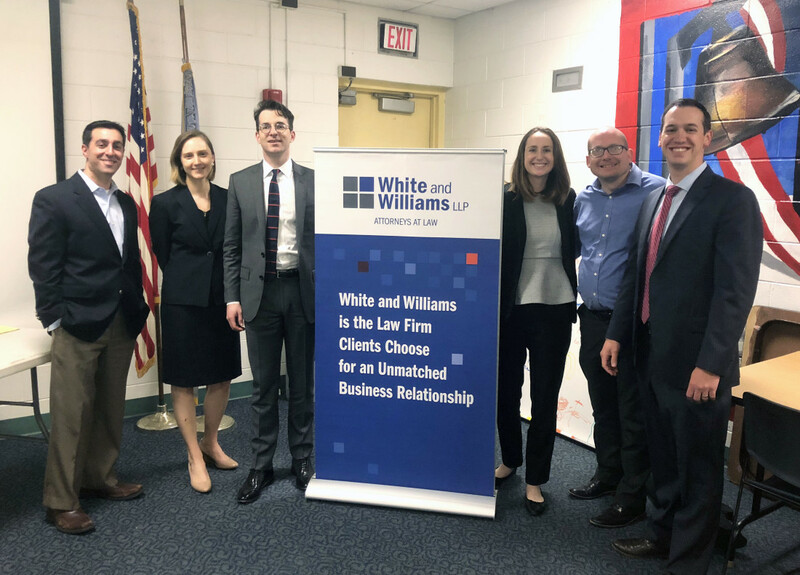 On Wednesday, May 2nd a group of White and Williams associates volunteered their time at Legal Advice Live. The group visited the Haverford Branch of the Free Library of Philadelphia where they met with members of the community to provide free, in-person confidential legal advice on a broad range of topics, including personal injury, landlord/tenant law, divorce and child custody matters, wills and estate planning, and employment law. “This is the perfect opportunity to connect with the citizens of Philadelphia while demonstrating a sense of civic commitment by offering free services and education," said Vince Barbera, an associate in the General Commercial Litigation Group and YLD Chair. "With a different activity each day, Law Week is a rewarding experience not only for the young lawyers but also for students and citizens generally." Pictured above from left: Mark Paladino, Caitlin Danis, Timothy Carroll, Clare Kealey, Michael Jervis and Vince Barbera.